Enjoy the freedom of Wi-Fi connectivity for any of your Ethernet enabled devices at home or in the office with IOGEAR's Ethernet-2-WiFi Universal Wireless Adapter. This is the ideal solution for devices that do not have built-in Wi-Fi and is universally compatible with any device with an Ethernet port. Avoid the clutter of cables and connect devices such as HDTVs, game consoles, and Blu-ray players to your Wi-Fi network. Older laptops, A/V receivers, network printers and other Ethernet only devices leave you at the mercy of a hardwired data connection. 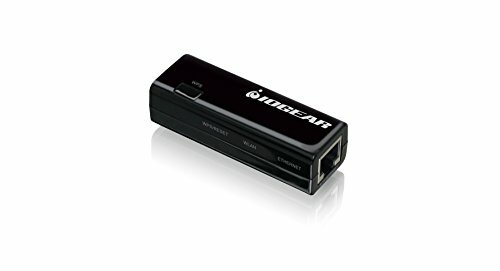 With IOGEAR's Ethernet-2-WiFi Universal Wireless Adapter, you can breathe new life into your legacy electronics by giving them Wi-Fi capability. Using dual antennas (2T2R), the adapter delivers data rates up to 300Mbps and boasts speeds twice that of IOGEAR's Universal Wireless-N Adapter (GWU627). The increased speed supplies sufficient bandwidth for faster file transfers, music downloads, video streaming, online gaming, and HD multimedia applications. Designed to be thinner and lighter to make applications clean and clutter free, the Ethernet-2-WiFi Adapter is 40% smaller than its predecessor, without having to sacrifice performance. The compact design gives you the freedom to place your home entertainment center practically anywhere and stay connected to your wireless network. No need for power from an outlet, this device is powered by a USB port giving you more freedom to place it anywhere. For instance, the prevalence of USB ports on TV sets allow for simple and fast connection of the Ethernet-2-WiFi Adapter to any USB enabled television using the included USB power cable. Instantly connect to your network with the push of a button. This device supports WEP, WPA, WPA2, TKIP and AES encryption standards to keep your wireless connection safe from intruders.